For a powerful Bible study experience, combine the best of the old (the King James Version) and the new (6,500 study notes from the Layman's Bible Commentary Series)! Having reached its 400th anniversary in 2011, the King James Version of the Bible remains one of the most popular translations available?and Barbour?s KJV Study Bible brings the venerable version into a 21st century context. This reasonably-priced paperback edition contains thousands of contemporary notes for greater understanding of the KJV. With individual book introductions and a dictionary/concordance section, the KJV Study Bible is an excellent resource for personal study or Sunday school and small group preparation. 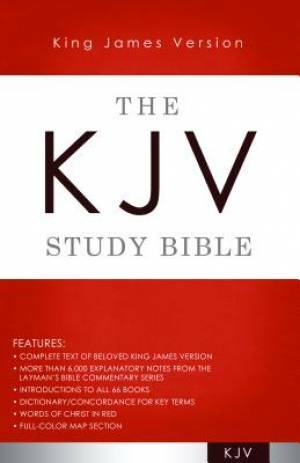 KJV Study Bible by Barbour Publishing was published by Barbour in February 2013 and is our 17971st best seller. The ISBN for KJV Study Bible is 9781620291658. Be the first to review KJV Study Bible! Got a question? No problem! Just click here to ask us about KJV Study Bible.